One of the most intriguing roster battles on the entire Eagles roster this offseason is the competition for the starting three linebacker positions. 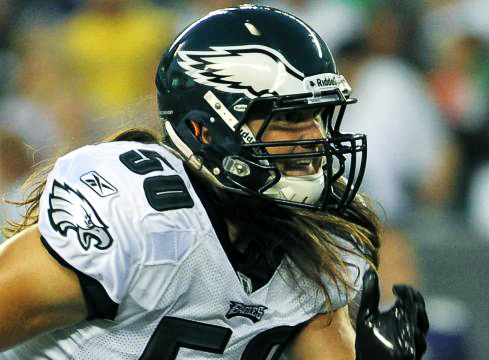 Last year the Eagle linebacker situation was something of a train wreck. So far the Eagles have used this offseason to trade for 7 year veteran Demeco Ryans and drafted Mychal Kendricks in the 2nd round of the NFL draft. These additions are very substantial and will go a long way toward solidifying the LB Corps and addressing a problem that just wasn’t going to go away on its own. 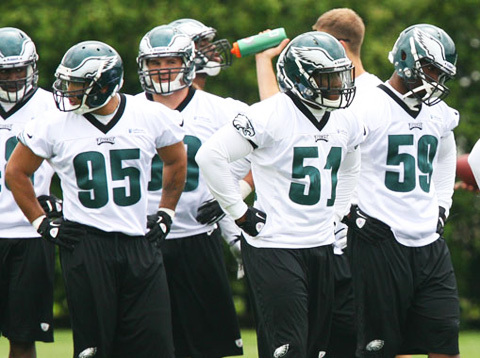 During the first team organized team activities on Tuesday May 22, the Eagles linebackers went through a number of position drills; what was particularly eye-opening about these drills is that they revealed a potential depth chart for the Linebacking group. Here is the Eagles LB Depth chart as presented in the Eagles on-field drills. Keenan Clayton #57 didn’t participate in the drills. Nothing is set in stone so far, but these were the lineups presented in the on field drills. The Eagles don’t frequently change up their preliminary position depth charts. Last year they plugged Casey Matthews into the starting MLB spot the second they drafted him and it took several in-game errors before they changed that depth chart, so it’s fair to assume they’ve put some thought into this depth chart. Training camp performance will ultimately decide who earns the starting positions, but based on past performance and overall skill sets, it’s safe to assume the starting LB group will look a lot like this. The Eagles have already plugged rookie Mychal Kendricks into the starting SAM LB spot, though some might fear a potential Casey Matthews-esque rookie linebacker blunder-fest, you should realize Kendricks will have a full offseason of OTAs and Training Camp to master this defense, something Matthews did not have. Kendricks may have his share of ups and downs, let’s just hope he has them in training camp and during the pre-season. Having Demeco Ryans next to him should aid his transition to the NFL. There has been much sentiment that Demeco Ryans would provide a leadership role for the Linebackers and Defense overall. 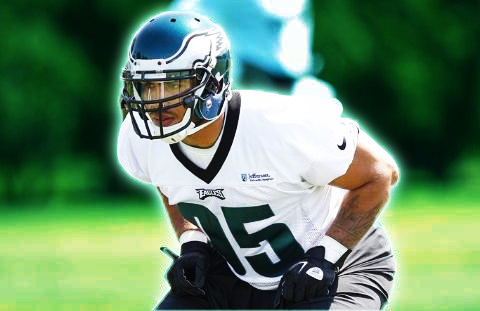 I found myself doubting the immediate leadership ability of Ryans on the Eagles based on his newness with the team and in the scheme, but after seeing him around the other Linebackers I can already see it developing. You have to remember most of the LBs on the Eagles are still just kids. It’s hard to be around Ryans without feeling humbled to be next to a two-time pro bowler and a lethal NFL Linebacker. What is most intriguing about this roster competition is who will earn the starting Weak side LB spot. Brian Rolle performed very well in that role last season, which may be why he has already been penciled into that spot this season. I personally would love to see Casey Matthews show that he has improved and could be a key contributor to the Eagles defense. This could be a very promising season from Casey Matthews, who with a full season to learn from and a full offseason to improve, has no where to go but up. It’s difficult to imagine that the Eagles will keep more than 6 or 7 linebackers on the final 53 man roster, so you can basically wipe the third string players off the potential roster. The final roster battle should come down to Akeem Jordan, Moise Fokou, Keenan Clayton, and possibly Greg Lloyd. Jordan and Clayton showed that they could be reliable contributors on special teams, but Moise Fokou hasn’t been a total letdown either. Fokou has stepped into the lineup many times to provide a more physical presence and has been especially effective in run defense. What do you think of the LB group overall? Can Ryans be a leader immediately?